The Lower Modernisms – 035. 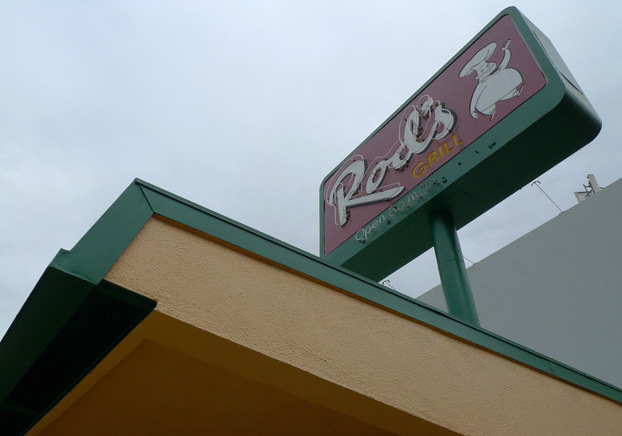 Lomo Featured Project: Rod’s Grill, Arcadia. 2011 Googie Coffee Shops Bicycle Ride Series, November Ride. December 3, 2011 by James Black. 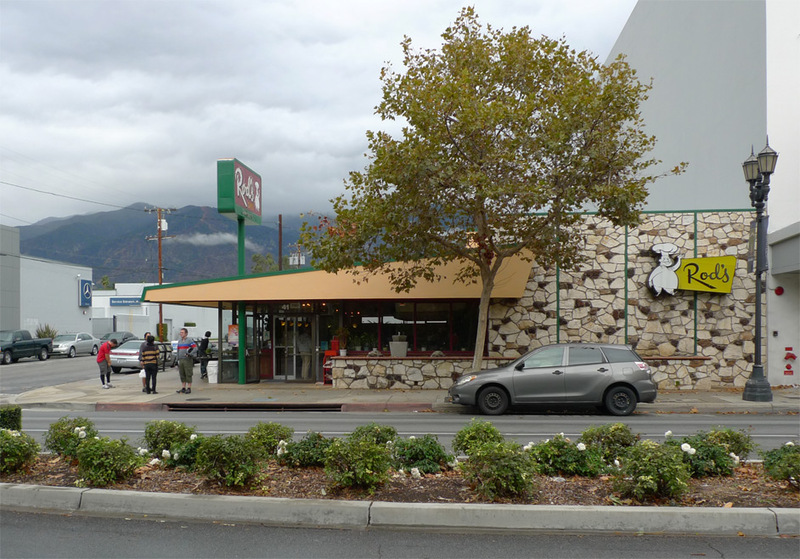 Four hearty riders participated in the November edition of the Googie Coffee Shops Bicycle Ride Series, traveling some 23 miles through damp and rain to visit Rod’s Grill, at 41 Huntington Drive in the city of Arcadia. 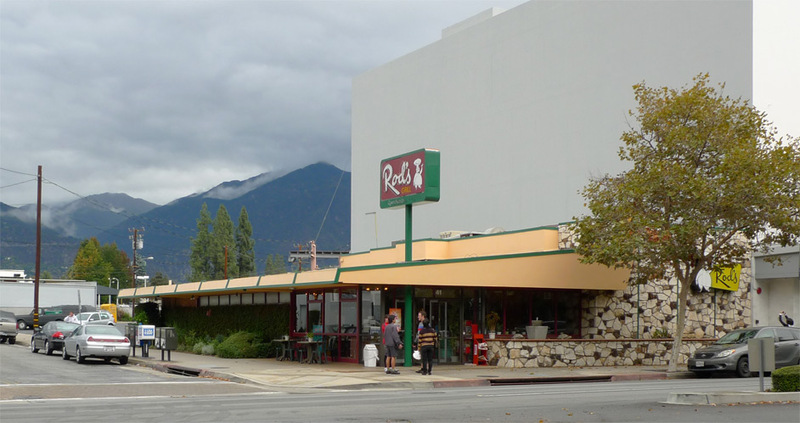 Allegedly built in 1956, Rod’s Grill is a fine specimen of the Googie coffee shop and remains in excellent condition. The identity of its architect is unknown to me. 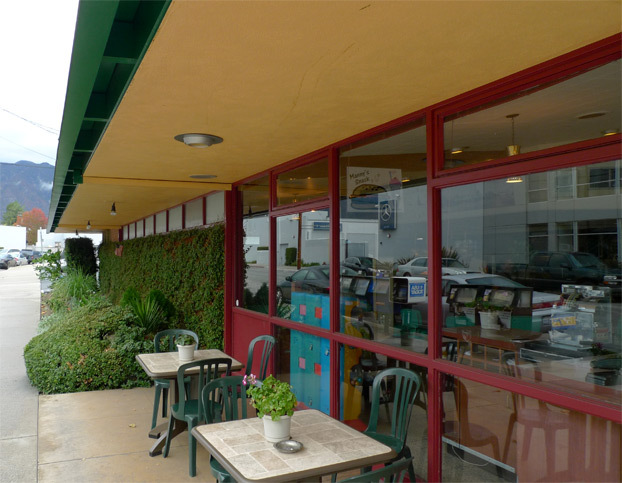 The exterior expression clearly reflects the organizational strategy – the east side of the building containing the kitchen and service space presents a windowless face to the street, detailed to look like a rectangular box clad in rock; out from this heavy mass projects a tapered, wing-like roof, seemingly floating over the dining area that it shelters. 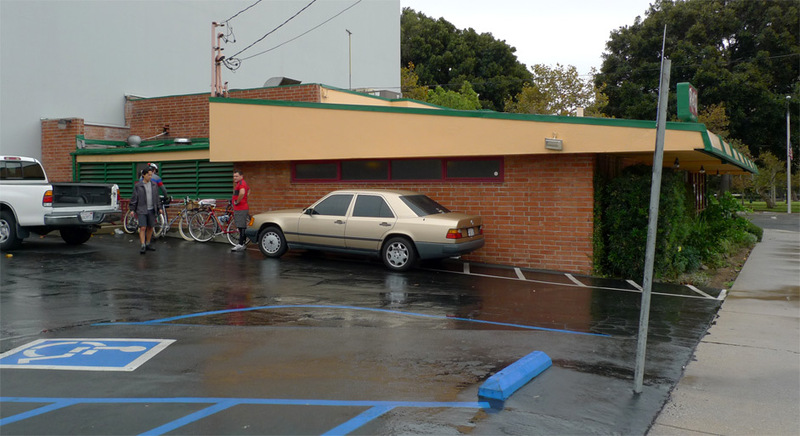 The profile and proportion of this roof give the building an overall low-slung horizontality. In tension with its expression as a mass, the front rock wall exhibits a strong graphic quality as a flat surface – the rock wall is divided into four panels by reveals, while the wall sign spans across two panels, centered over one of these reveals. The signage is almost too good to be true. 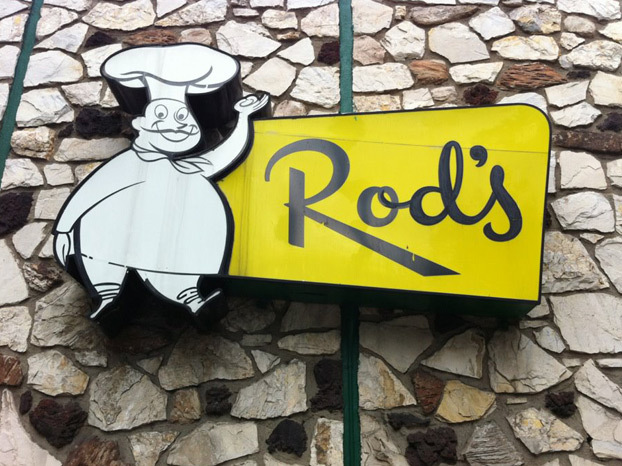 Where’s my “Rod’s” t-shirt? The expressive profile of this roof continues all the way around to the back – it is a three-dimensional building, not merely a decorated façade. Ribs of contrasting 1x wood trim, folded down to follow the line of the raked fascia, give an accent to the roofline both at its edge and along its length, dividing the long surface into panels. The red brick naturally is stacked in the jauntiest of patterns, the one-third running bond. Where the full-height storefront gives way to solid wall, clerestory glazing at the soffit line maintains the expression that the roof is floating free rather than supported by the wall below. The fascia conceals a hidden gutter, but this artifice is exposed and dramatized by holding the plaster soffit back with a wide reveal, exposing the roof beams. Downspouts are torturously bent and painted in yellow and brown in an endearingly unsuccessful attempt to integrate them into the design. The surfaces are surprisingly well maintained. 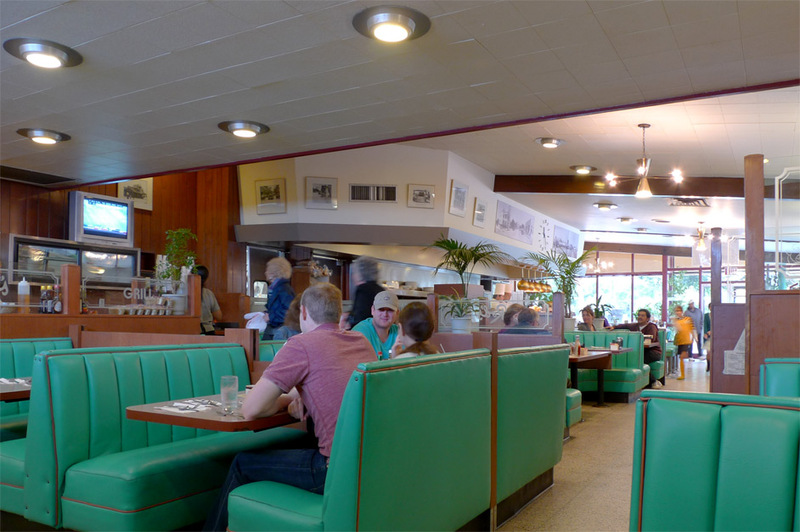 The inside is classic Googie – counter facing the open kitchen, banquettes against the wall. The roof slopes down toward the window, contrary to the Armét & Davis model. The ceiling reveals that the pseudo-truss expression of the tapered forms on the front and rear of the building are not the actual roof form, but the roof is indeed sloping. The soffit above the open kitchen is raked to maintain a perpendicular angle to the roofline. 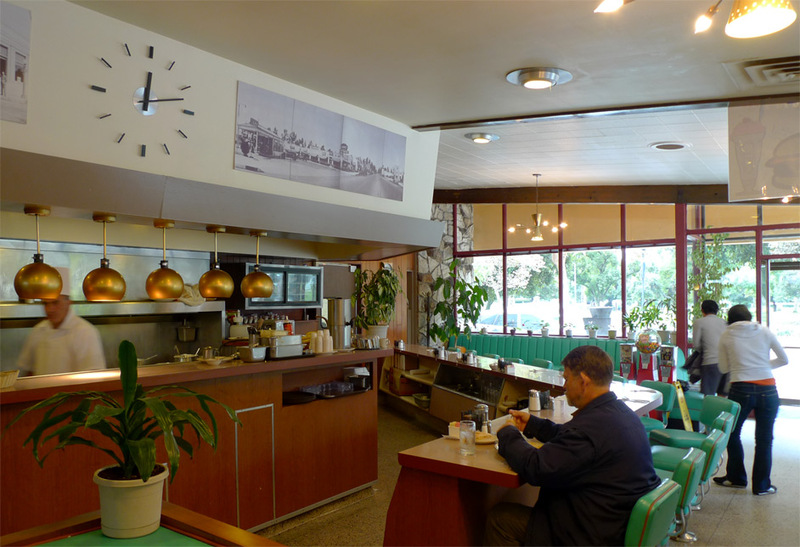 The space is kitted out with an assortment of well integrated light fixtures and clocks. The cooks wear tall, white cylindrical hats. The food was good, in precisely the way you would expect. 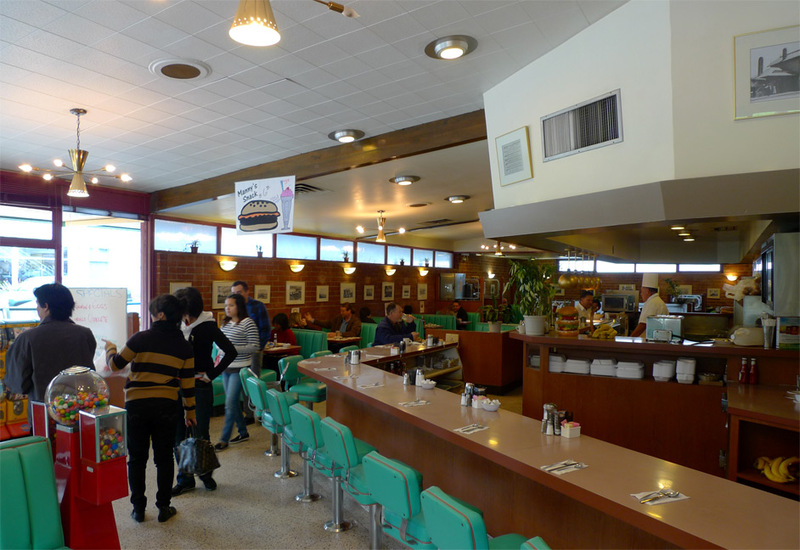 with those misty mountains lurking in the background, one might expect to see special agent dale cooper at the counter.